Hey Diddle Diddle! 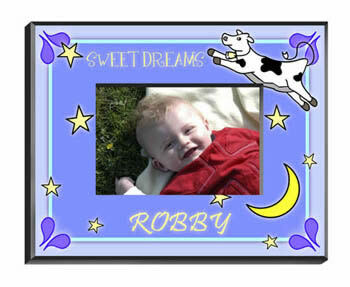 Enjoy the funny fairy-tale jumping cow on this starry blue frame, just right for a little ones nursery or bedroom. Moon included! Special Sweet Dreams message wishes him pleasant thoughts for a good nights sleep. Frame measures 8" x 10" and holds a 4" x 6" photo. Our personalized frames are perfect for your favorite picture. They make great room decorations and keepsakes. Personalize this frame with a name.